2.2 Selecting DBT or DPT? 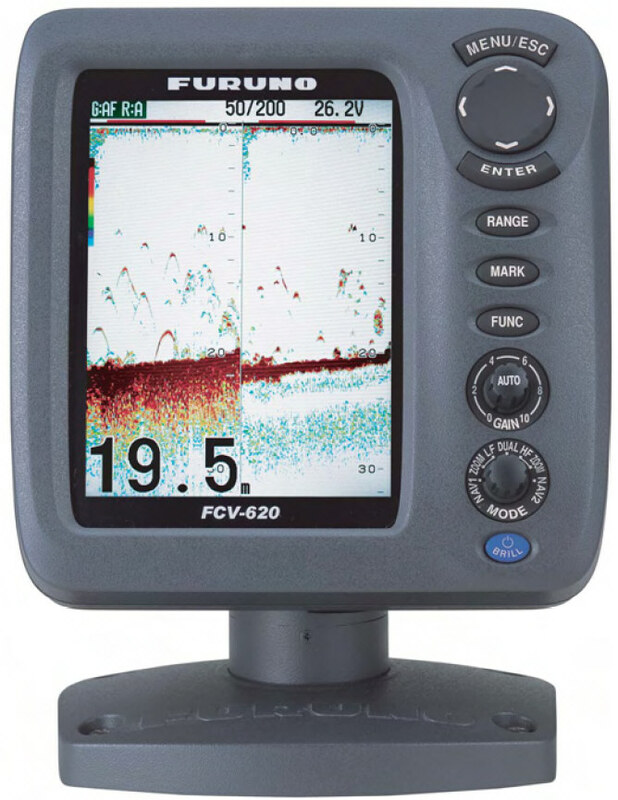 Furuno Echo Sounder mod. FCV620 (click to zoom). The vessel is furnished with echo sounder with portable transducer, intended for use when traversing open ocean areas. The vessel hull is of course not in contact with water when hovering, so the echo sounder transducer must be lowered into the water by other methods. The echo sounder outputs depth information, which is merged with latitude/longitude and stored on external logger. Data is output at two-second intervals. 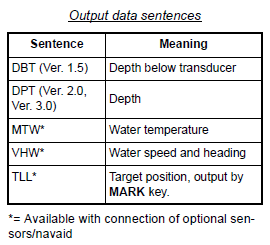 It seems the Furuno FCV-620 Echo Sounder outputs the DPT telegram with TWO instead of THREE parameters, as prescribed in format specification. 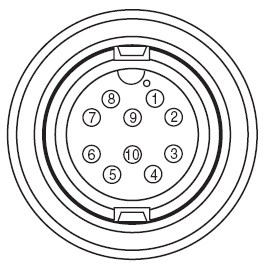 There are slight variations in different manufacturer's implementation of the NMEA standard. We will log the DPT telegram from the Furuno FCV-620. 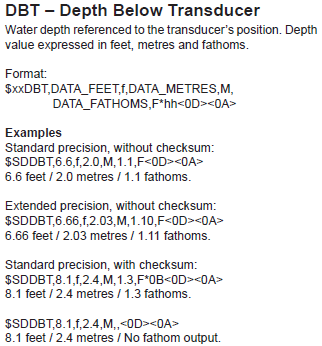 It has two parameters; the first one is DEPTH BELOW TRANSDUCER, and the second is, at the moment, not determined (see data sample below - it's always set to zero - most likely the offset value, either to waterline or vessel keel). 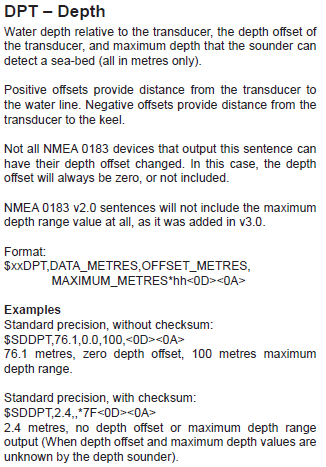 Please refer to NMEA 0183 Information sheet, by Actisense (Local copy) for further information. where depth below transducer is 18.43 meter. To run this program (or script) you need to install Python and two additional library modules. If you want to edit the program source code, there is a nice Windows editor called Programmer's Notepad. 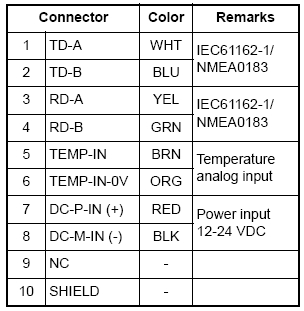 Data output should be on Pin 1 and 2, denoted "TD-A" and "TD-B", respectively. Denoting the signal lines in such a way indicates a differential signalling scheme - otherwise known as RS-485 and RS-422. There is reference to the IEC 61162-1 standard; it's only available for purchase. An earlier version of the IEC 61162-1 standard can be downloaded from this web site. 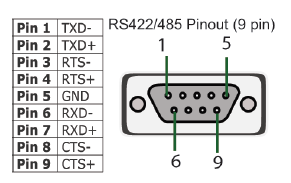 In order to log data to PC - which accepts signals according to the RS-232 standard - we need an interface converter that accepts RS-422 signals and converts them to RS-232. 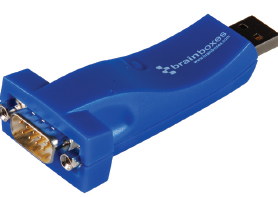 Used the US-324 USB2SERIAL 1xRS422/485 adapter from BrainBoxes. Link to Vendor product web page. 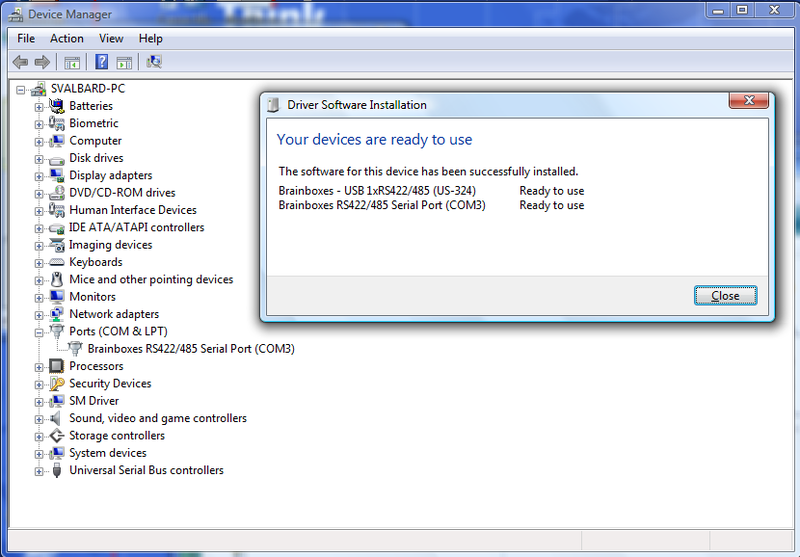 After installing driver software and connection the adapter to USB port, it appeared as COM port in Device Manager. PIN 1 : "TD-A" (wire color: White) PIN 6 : "RXD-"
PIN 2 : "TD-B" (wire color: Blue) PIN 6 : "RXD+"
Capture of data from echo sounder is achieved by a combined GPS- and echo sounder logging program. Screenshot of this program during normal operation is shown below. In addition to the stream of telegrams being logged, there is also, once every minute, a clearly readable indication of LATITUDE, LONGITUDE and UTC TIME. This is meant as a crew convenience. 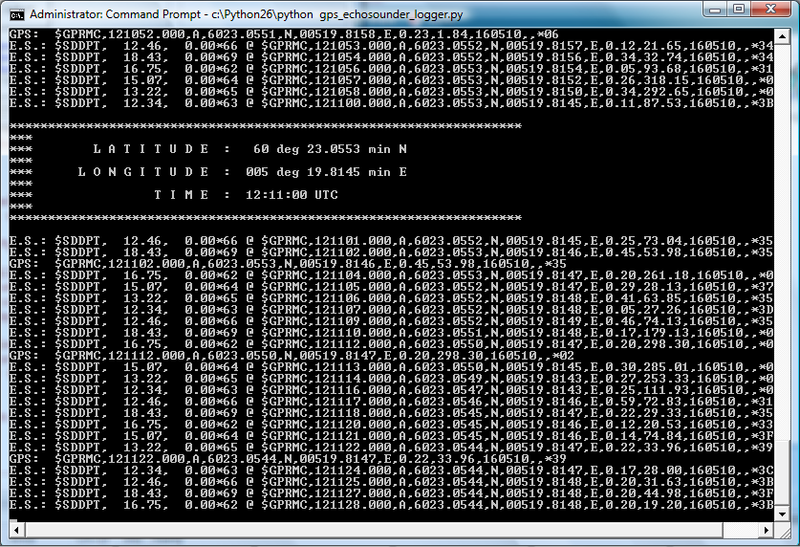 Screenshot of combined GPS and Echo sounder logging software. Information on logging software is on separate page. We will later evaluate LabIML 4.3 for the same purpose.